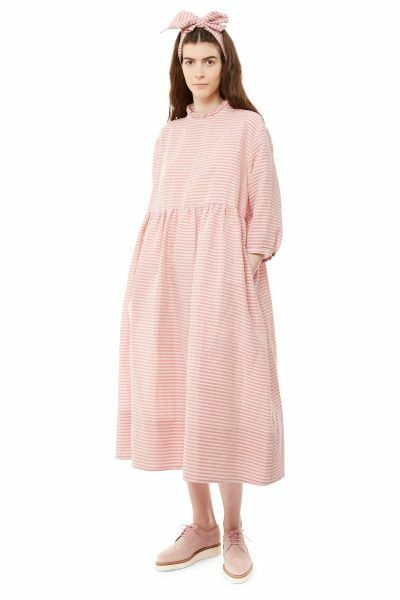 The Lola dress in pink & oatmeal stripe is a classic smock style dress. There is a smart pleated ruffle at the neckline to make her that extra bit special. The skirt is gently gathered to the bodice and has side seam pockets. The bodice is loose fitting with slightly dropped shoulders giving Lola a relaxed fit. 7 little Cabbages and Roses engraved buttons fasten down the centre back. Three quarter length sleeves finish perfectly at a neat fitted cuff. Lola is unlined. Caring for your Dress. Lola can be machine washed at 30°, we recommend using Ecover Delicate Laundry Liquid. Can be dry cleaned, if you must with an ecologically friendly dry cleaner. Press with a warm iron. Please do not bleach or tumble dry Lola.